The Herald of the New Age, Preparing the minds of men for the coming of that Age, Devoted to the study of the Soul and of Experiences of an inner nature pertaining to Soul life. Akron, then Toledo, OH. Publisher: Sun Publishing Company. Editor: Joseph Sieber Benner (?). 1/1, January 1933-1936. 48-56 pp., $2.50-$1.50 a year. Although his name nowhere appears, nor that of his Sun Center of which it was the organ, the journal was the work of Joseph Sieber Benner (1872-1938), a wealthy Akron business man (he owned the Sun Publishing Company, publisher of the journal). In his early 40s he received (directly from the Christ within, he said) the message that each person's inner self was the Divine Spirit. 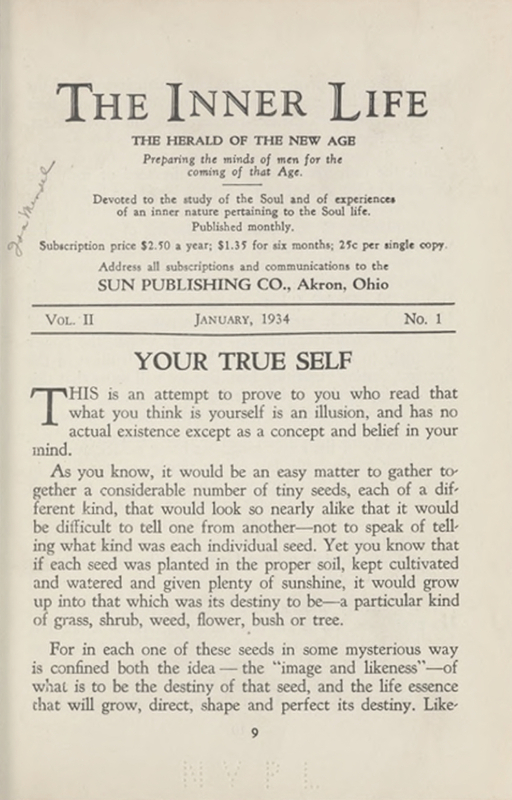 He published this revelation, anonymously, in The Impersonal Life (1914), which was the cornerstone of the teachings in this journal: "More than all, try to realize that the 'I' speaking throughout the Message is the Spirit within, your own Soul, the Impersonal Self, the Real You; the same Self that in other moments of quiet points out to you your mistakes, your follies, weaknesses, and is ever chiding and live up to Its ideals, which It continually holds before your mental gaze. . . . The great blessing of the Message that, if you are ready, the 'I' speaking herein will continue to speak direct to you from out your own heart, after you lay aside the book, and in so intimate and convincing a way that will make clear all your problems, be to you fount of Wisdom and Strength, and bring you Peace, Health, Happiness, Freedom, --an abundance of every thing your heart desires." The book was Elvis Presley's favorite. On the basis of these revelations, Benner in 1920 started the Sun Center, which supplied its students with a series of Inner Life Courses and Impersonal Life Teachings and taught them how to realize their divine inner self on a daily basis. At noon precisely, the names of all who wrote with their questions and problems to the Sun Center were taken "into the Silence of the Spirit, allowing "each earnest seeker to heal and lift himself out of all conditions of inharmony, disease, lack and limitation." This was called "the Noonday Chalice," and all were invited to join in wherever they were, to open the way for their Brothers in Christ to "pour the Light and Power of Divine Love" into their hearts. The journal published regular correspondence from students complete with responses to difficulties, and articles on dream interpretation, and the coming tribulations that were to accompany the arrival of the Aquarian Age. The journal was advertised regularly in William Dudley Pelley's New Liberator, which may indicate a connection between Pelley and Benner. NYPL (sealed-up version here).